I’ll be brief here, folks …I’m angry. And dumb. And being dumb and angry is no way to go through life. I’m angry because the video you are about to see looks like I’m still taking pictures with my 2.0 Megapixel CoDack (correct, an unknown brand, but it was cheap). I’m angry at Nero for selling me video editing software without directions. I’m angry because after all this time I’ve never gone to Nero’s website and watched any sort of tutorials. I’m angry because Nero made software that looks like I want it to look, but doesn’t really perform the tasks I want it to. I’m dumb for all the same reasons. I spent many hours this weekend pouring over this silly little slideshow, and given my past productions (The 50th Anniversay Slide Show) …I know I possess the brilliance to make a simple slideshow with music. I feel like Tiger Woods. Not because I have 28 mistresses, but because I know somewhere buried inside me I have at least a little computer literacy (as Tiger has golf ability) and I’m struggling. And I don’t have $2,000 for an iMac. But because I want the 5 or 6 people who read my blog to keep reading (actually, I’m up to almost 38 unique visitors and 12 subscribers), I’m going to post this video anyway. It also sets me up for a future post when I re-cut this thing. I’ll call it Vacation Memories Remastered. Does anyone have a suggestion on better video editing software for a Toshiba laptop? The music used for this slideshow may seem odd. And lyrically …I agree. However, my good friend Jeff gave me a CD of the Spartan Dischords and my kids LOVE it. It’s an a capella vocal group at Michigan State University, and Jeff’s son Chris is a member. Great CD and if you like a capella singing, even a little, go to the Spartan Dischords site and buy “Better than Nothing.” This particular track is Track #19 and includes outtakes. I say again …outtakes. Because if you listen to this and nothing else, you might come away thinking, “wow …those Spartan Dischords aren’t very good.” Trust me …they are GREAT. 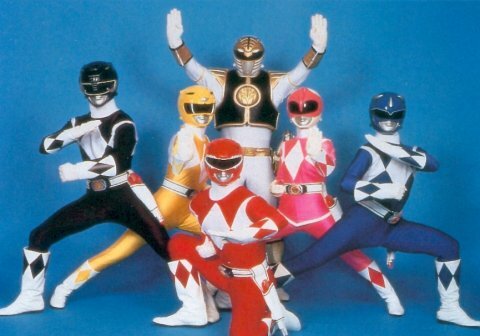 Listen through to the end and their recreation of the Mighty Morphin Power Rangers theme song. My kids love that part and the other funny stuff in this track leading up to it. My only regret is how nice the audio is …I had hoped I could get it to sound like an old record player to go along with the pixelized photos. Much more to come all week including “name Don’s salsa company” contest, Don writes other stuff, new blogroll friends, and all the great content you’ve come to love about Kaleidoscopic Raygun. Follow @donkowalewski on Twitter and ‘Like’ Kaleidoscopic Raygun on Facebook. My passing interest on the topics of “buy local”, coffee, and coffee and tea shops is suddenly evolving into some sort of obsession. I feel as if I’m dancing dangerously close to a line that separates normal, average patrons from obsessed superfans who are one inappropriate comment from being kicked out of someplace or being issued a restraining order. Waiters and waitresses know what I’m talking about. Show me an Applebee’s, Chili’s, or Max & Erma’s, and I’ll show you a socially awkward adult with bad skin who thinks the polite waitress or bartender is his friend, stays too long, scares the other customers, drinks mostly Coke and water instead of cocktails, doesn’t tip, and talks too much about whatever topic might be on his mind on any such particular night. And he or she is there probably 5 nights a week. If this awkward adult is a “she”, she probably brings her knitting. I like to think I’m a sophisticated coffee drinker with a sensitive pallet and these locally owned coffee shops appreciate my passion for great coffee. I like to think I am to coffee what a sommelier is to wine and vineyards, or an art lover is to paintings, sculptures, and a gallery. Until I see horrified looks on the faces of customers at Commonwealth, well, I’ll just keep thinking I’m the all-star customer, opinion leader, and early-adopter a 9-month old coffee shop like Commonwealth needs in order to succeed. Commowealth’s vibe is the vibe and mood we thought was drawing us to places like Starbucks and Caribou for all these years. We let Starbucks paint a picture of a simple coffee shop interested only in roasting tasty beans and we flocked to it. We flocked, you flocked, they flocked, we bought mugs and beans and we’ve been clinging to this idea of a “coffee shop on the corner” for well over a decade. But now, many of us are waking up and realizing, “hey …Starbucks beans taste burnt – sometimes. And good – sometimes. And, wait, they don’t even really care about their coffee; they only care about their specialty drinks, merchandise sales, and how many people they can pass through their doors as quickly as possible.” Starbucks is to a cup of coffee what McDonald’s is to a hamburger. Starbucks hires kids who look like coffee hippies, but they are no more coffee hippies than similar kids working around the corner at the massive movie chain complex. Today, at Commonwealth, I met their roaster …Josh? He introduced himself to me. He talked about their Ethiopian beans and mentioned fair trade and well-payed farmers. He mentioned being part of a mission that traveled to Honduras and this fall they’ll be featuring and roasting yet another bean from this handpicked farm in South America. And even if I’m only accurately remembering 50% of what he said, it’s still pretty awesome. Do you want to serve coffee at your next dinner party that came with a book or with a Tori Amos Sings ’80s Standards CD in a paper CD case? Or do you want your beans, like wine, to have a story behind it? Come to think of it, Commonwealth’s roaster had tattoos, an earing, and a chin beard – might’ve been a goatee. Either way …it was cool. I want to meet you for coffee. Name the date and time – I know the perfect place. Follow @donkowalewski or his alter-ego @spunkybean where he writes about Bachelor Pad, American Idol, and much, much more. One of the best things I’ve done recently was join Detroit Bloggers. Technically, it wasn’t something I was putting off. The group only started last month. But …in the past, I’ve blown off cool things like that and then wondered why great things never happen to me. I can’t say joining Detroit Bloggers will automatically make great things happen to me, but I feel great having met a buncha fun, passionate writers. As I’ve said in the past …anyone can Facebook and Twitter, but to run a blog and create content – that takes a different D.N.A. Because you’re reading this, you know I launched a new blog. One things bloggers MUST do is keep their blogroll tidy and up-to-date. A blogroll is a sidebar on your blog where you link all the other great bloggers you read, you admire, and whom inspire you. It’s like a “Follow Friday” that never goes away. It serves a few other purposes. (1) If people frequently visit your site, and remember you talk about this great person who writes a great vegetarian blog for example, but maybe they forgot to bookmark it, they can find that vegetarian blogger easily by going back to your blog. (2) Bloggers on your blogroll might put your blog on their blogroll. Bloggers are the friendliest people on earth. In a bloggers mind, they will be as happy if your blog succeeds as they will be if their own blog succeeds. It’s true. Bloggers never say, “but Don is an idiot …how come he has so many readers and I don’t? I hate him.” No …bloggers say, “high-five, dude. How’d you do it?” And then we bloggers all try harder and smarter to be the next big blog in the blogosphere. (3) A blogroll reminds you, the blogger, to keep checking certain blogs and sites. Let’s face it …despite how we all self-market using Facebook and Twitter, some fans, readers, and fellow bloggers are bound to miss a few Tweets or status updates every now and then. Having your favorite blogs on your blogroll gives you a spot for important people you want to support and whom you like reading. Here’s five new blog friends and their blogs – which I’ve recently added to my blogroll at the right. It’s been great getting to know the people (in person) and through their writing. spunkybean – OK. This is my blog. It’s about pop-culture and our favorite TV shows. Me and my fellow writers love watching TV so, well, why not write about it? We keep it light and fun. Two great pieces we wrote recently inlclude Kickstart’s KNOWBODYS – The Matt Maiellaro Interview and TV’s Greatest Bands – A Handy Guide. The first is a look at the upstart Kickstart Comics, the second a tribute to the best fake TV bands of all time. Mommy Is In Timeout – This lady founded (one of three founders, actually) Detroit Bloggers. I’m not a Mom (I’m a Dad) and technically I shouldn’t “get” what the heck she’s blogging about, but she’s totally funny. Her blog entries echo some of the words I hear from my wife. And her videos are inspired. Music …pictures …improv. What editing software is she using? Real Life Husband/Dad/WannaBe Rockstar – I envy him because he’s a little (OK, alot) more focused than I am. He writes about being a middle-aged Dad who refuses to give up the dream. That’s just like me. His blog is cool. He’s right …dudes …don’t stop dreaming. No, your NFL career is over, but playing guitar …trying stand-up comedy …running a marathon. Keep dreamin’. The Vegan Vibe – Another busy, stressed out Mom who started a blog about being a vegetarian in a non-veggie world and non-veggie household (she has a husband and two sons who like hamburgers and she ain’t stoppin’ ’em). She’s new to blogging and vegetarianism but aren’t we all before we’re not so new, anymore? Yes. Thinking about it – blogging or being vegetarian? Read her blog. Take the journey with her. On the Road Again – I met her at the first Detroit Bloggers meeting and I was smitten (with her story, and now her blog). She’s funny. She’s casual. She eats Cold Stone Creamery and makes no apologies for it …she’ll just add another 1/2-mile to her next run. Or she won’t. Leave her alone. Anyway …are you a runner but not one of those zero-percent body-fat running-triathlon animals? You’ll like this blog. Essential Elements – She’s another founder of Detroit Bloggers (I’m 99% sure …I’m so bad with names, details, and …um ….something else). She’s very nice. Her kind spirit and enthusiasm for niceness and happiness, combined with her belief in essential life elements like creativity, happiness, love, passion, success, motivation, inspiration, and so on …well, it’s a nice break from this debt ceiling, Obama birthers, England riots, and stock market crashing world. The Literary World of Sylvia Hubbard – Question? Have you been meaning to write a book? Perfect. Like me, have you often wondered, well, if I write it …then what? Chances are, Sylvia knows. Sylvia is connected and in-the-know. She’s so informed, I’m not actually sure entirely how to summarize what a resource she is. Just …um, make sure you hit the next Detroit Bloggers meeting and shake her hand. Cool. This is just a taste. My new blog is, well, new. Many more awesome bloggers will be added to my blog roll. I hope you’ll check ’em out. You’re bound to like one of ’em. And, finally …really …I’m going go get to my vacation recap. Let’s just say …when I wasn’t trying stupid shallow-water somersaults, I did some waterskiing. And lucky for you (me), my wife captured my waterskiing magic. I’ve talked about, read about, and learned more about coffee in the past couple months than in the previous 20 years combined. For most of my life, coffee was Maxwell House from a can, scooped into a filter, brewed and percolated, and 15 minutes later, I was likely sharing part of a pot of coffee with someone. I liked coffee, even back then. I was so young …so naive. Flash forward 20 years, and I’m borderline obsessive about my coffee. I can’t remember the last time (outside of a highway gas station when a “caffeine fix” was the end game) I had a drip brew cup of coffee. It’s not like I choke and gag when I drink a drip brew, but I’ve come too far with the AeroPress, French Presses, and Americanos at my local coffee houses. I can’t go back to the old way. I learned, like a wine lover who wouldn’t be caught dead drinking a glass of Woodbridge Cabernet from a gallon-sized bottle, I like coffee not just for the caffeine fix, but for the flavor, texture, and taste. I’ve learned about the brewing processes and determined the AeroPress is the one for me. Now, I’m on a quest for the perfect bean (and the Tanzanian Peaberry from Chazzano in Ferndale, MI is about the best I’ve found). I talk alot about the AeroPress. I learned of the AeroPress from my cousin Scott. His Dad, whom I call Uncle Jerry, is a curious sort of person and when someone like me talks incessantly about something, he’s apt to Google the topic and learn more about it. I’m not the type of guy to “learn” …I just boldly dive head first into things and hope for the best. Turns out, there are AeroPress Championships and there’s an even better technique than the standard AeroPress technique for brewing an amazing cup of coffee. It’s the Upside Down AeroPress. So I tried it. My first attempt didn’t yield a cup of coffee so brilliant I’m ready to brew upside down and only upside down, but it was pretty good. And I could see this technique being used when making coffee for multiple people. However, it was good. And as is probably the main reason I do anything, it’s something to talk about. If I have you over for dinner …trust me. You’re having a cup of coffee, you’re going to hear about where I bought the beans and why I like the beans, and you’re going to hear why and how I make my coffee the way I make my coffee.What? You’d rather talk politics, debt ceiling, or the U.S. credit rating? No …thank …you. Here’s the upside down AeroPress technique. Try it. I expected some mess. There was no mess. It’s pretty much the same process – but with flair. Yet another vacation memory, and I haven’t even talked about the really good parts of vacation. I’ve only touched on the nearly horrible neck injury I almost had, and now the coffee. More to come. Thanks for reading. Oh, and if you want to read more and perhaps ORDER AN AEROPRESS, click here and follow the links. My 9-day vacation holds many memories, but the thing I’m freaked out about was the second to last day and how I nearly broke my neck – and I’m not even kidding. I Tweeted about this briefly, but I keep replaying the moment back in my mind and …phew …it could’ve been really, really bad. I felt and heard my neck crack and fold backwards. My daughter and I were on the sandbar, in less than 3 feet of water. Do you see where this is going? She was doing underwater somersaults. An 8-year-old can easily do an underwater somersault in 3-feet of water because an 8-year-old girl weighs next to nothing and can gently roll forward or backward and flip around in the water. I, however, am 38 years old and even with my short 5’4″ frame, in 3-feet of water (it might’ve been less), there’s not much room for error. Plus, as a 38-year-old, I don’t do many underwater somersaults anymore, so I tried to give myself a little jump start and sorta half-dove into what would’ve been a pretty nice somersault …had I been in 5 feet of water. 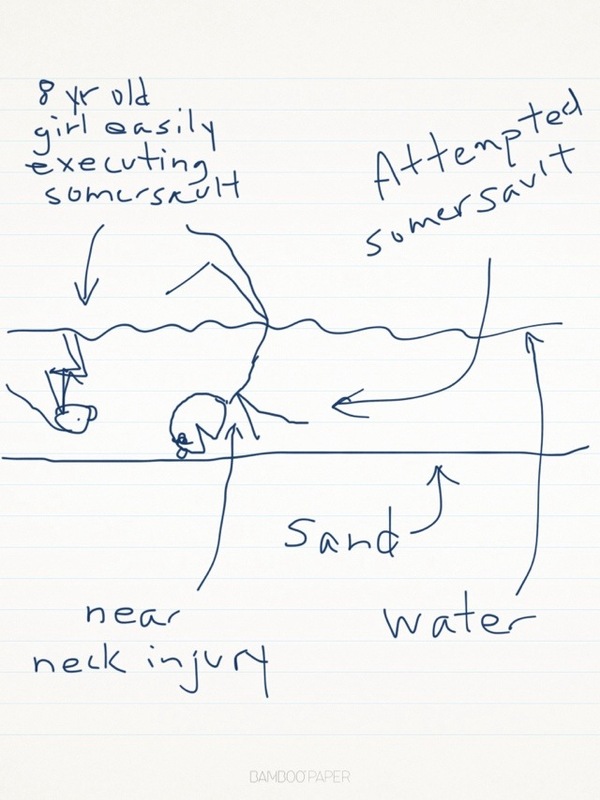 In 3-feet of water, this half-dive resembles an ACTUAL dive and I essentially jammed myself face (head) first into the sand and ate a mouthful of sand as the rest of my body kept going in the general direction of a somersault …but my head was planted in the sand. It all happened in an instant and as I sit here, 72 hours later, I feel like I dodged a bullet and my neck feels like I was in a pretty bad car accident. It might seem odd to start the first blog entry following my vacation as a message about a near life-altering mistake that’s tormenting me, and I always come back from vacations with thoughts of changing my life and using it as a new jumping off point, but all these years later and all these vacations later, nothing’s changed. Maybe I’m being overdramatic, but this is a vacation-lesson that will stick with me (at least the neck soreness will still linger for a few days). I’m reading “4-Hour Workweek” and doing “4-Hour Body.” I’m in the process of convincing myself I can have a career and then 2 or 3 passive sources of income, and that I can have six-pack abs. I will stop taking unnecessary risks with few rewards (like diving off the ends of docks or doing underwater somersaults in shallow water). How many times can I expect to do dumb stuff and avoid catastrophe? I need to eat better. Sleep more. Stop thinking about what I might, could, and should do …and start doing it. I can’t do underwater stunts. With my lung thing, I shouldn’t ever really do more than a 5K and I should just enjoy the running (versus pushing myself to the brink of collapse just so I can boast I can run a mile in under 8-minutes …which is a weak thing to boast, anyway). Anyway …that’s the biggest thing that happened to me on my vacation. I’ll have lots of pictures of sandcastles and whatnot, and I’ll try and journal the wonderful week and talk about making home movies and making memories. But for a moment, my vacation has given me reason to reflect …and refocus. May it not take a near tragic neck injury the next time. My D.N.A. is such that the sole reason I work is so that I can take long breaks from working. I kinda like my job(s) believe it or not, but I love taking a vacation from it. Earth shattering blogging, I know. Instead, I figured out a way to simply enjoy relaxing. I barely checked my Blackberry but once or twice a day (you can’t expect me to go totally cold-turkey). I didn’t once check-in at the office. I swam in the water with my kids for hours and hours (something rare, I noticed …most adults do NOT swim with their kids, but simply sit on shore or a dock and watch their kids swim …why?). I built sand castles (which is suddenly becoming my vacation thing to do). I went tubing and water skiing. I went to the sand bar twice (thrice if you count this other little lagoon as a “sand bar.”) I hadn’t planned on it, but I rented a paddle board for a day and the kids loved it. I should’ve had plans of having no plan – I would’ve felt more accomplished. My 8-year-old said yesterday she was sorta glad to be going home because she misses her bed and her toys, so that means 8 or 9 days is a perfect vacation length. I kinda agree. I mean …I agree until 12 noon tomorrow when I’m still filtering through the 500 emails that wait for me in my office in-box, and until I’m bothered by my long-sleeve dress shirt and wool dress pants that will replace my bathing suit and t-shirt (or no t-shirt) that was my vacation wardrobe. I guess vacation isn’t “vacation” unless you have something to take a vacation from, so I’ll look forward and work and work until the next one. Profound? No. See why I didn’t do much blogging? It’s time to pack up. Soon we’ll hit the road and head back into the city. I’ll trade a view of a crystal blue lake for a dry, yellow lawn. I’ll trade sandcastle building for negotiating and sitting in traffic. But I wouldn’t trade any of it. So you stuck around for a second entry? Thanks. I promise, I’m going to clean up this place. Do you think I want white font on a kaleidoscope background? No, I do not. My web designer (also known as “me”) is on vacation. Speaking of vacation …just because a man goes on vacation doesn’t mean he should have to spend his morning drinking bad coffee. Packing for vacation is never fun. You make lists. You, at first, have plenty of time and then suddenly it’s the day before, and the morning of, and you’re running around trying to find all your phone chargers and power chords, you keep remembering things that weren’t on your list, preparation leads to a sense of panic, you can’t get the timers to work, and all the yelling going on between you, your spouse, your kids, and the post office and their refusal to employ a human capable of answering a phone and accurately stopping your mail …it all makes you wonder why you go on vacation at all. Back to the coffee and stress. I decided, amidst the chaos, something urgently important was figuring out a way to travel with my Aeropress and my gourmet Chazzano coffee (Tanzanian Peaberry, to be exact). So, did I spend the entire morning of our departure searching high and low in my house for a worthy box (aka “case”) for transporting my coffee routine and ritual (it was the box from my netbook …and she said it’s silly that I keep the boxes that all my electronic devices come in …”last laugh” …I’m having it)? Then, did I spend quality packing/organizing time peeling off price tags and labels of said netbook box, and did I spend more time with a black Sharpie covering up stuff? Again …yes, I did. And will I, at some future time, hit Jo-Ann Fabrics or Michael’s and find foam that I can cut-out in the shape of my coffee grinder, my Aeropress, the filters, and bags of beans? Yes. I will. And I’ll film that, too. I’m happy to report, however, that 24 hours later, I’m sitting, writing, enjoying magnificent coffee, and the pre-packing, pre-trip fighting and fits have turned into smiles and 3 kids sleeping in late. It was all worth it. See you tomorrow.